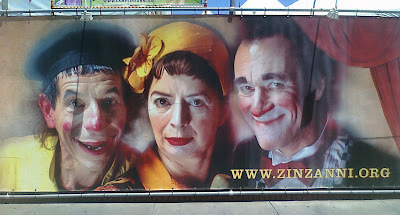 Along the Embarcadero is the Teatro ZinZanni, a nightclub/dinner theater that is described on its website as "a bewitching evening of European Cabaret and Cirque, Divas and Madmen, Spectacle and Sensuality." My god, I still can't get these faces out of my head. The one in the middle is eerily serious, and the freak on the left appears as if he's about to kill someone. He looks like Jerry Robinson's inspiration for the Joker. But the Joker was created in 1940, so this can't be...or can it?